It’s an amazing feeling - waking up on Easter Sunday to be greeted with a renewed sense of God’s amazing, unfailing love for us. Right? We are suddenly lighter on our feet, filled with pure joy and ready to join our loved ones in celebrating the resurrection of our Savior Jesus Christ. Yes, Easter is a beautifully amazing holiday - one that stands out from the rest. Why? Because to fully understand the celebration, to fully accept the joy of the season, we must first comprehend the hard truth of Jesus’ sacrifice. So, the question is: how can we prepare ourselves and our families in the days leading up to Easter so that we can fully accept His love and grace on that beautiful Easter Sunday morning? 1. Set aside family devotional time. Start 10 days before Easter, and set aside time as a family to read Scriptures about the crucifixion, death, burial and resurrection of Jesus. Open up the floor for any questions and dive into the Word. Check out our Bible journaling resources and tools - this could be the perfect way to unite your family around a specific Scripture, spurring discussions and conversations around the topic at hand. (Family devotional time might look a little different if you have preschoolers - if this is the case, you may want to check out some of our Easter books and activities for kids). 2. Listen to your favorite Easter hymns. Between work, home, bills, committee meetings and church gatherings, we know life is busy. Why not fill your vehicle with some of your favorite Easter tunes? Introduce old hymns to your kids and sing along. After all, lyrics such as “on a hill far away stood an old rugged cross” have a way of touching our hearts, reminding us of His sacrifice, love and grace. You could even add this décor piece to your home to keep the reminder in your heart year round. 3. Organize a family service project. In John 13:5 NIV, it says “he poured water into a basin and began to wash his disciples’ feet, drying them with the towel that was wrapped around him.” Read John 13 together, and decide as a family how you might reach out and bless others. For that is exactly what Jesus asks us to do in John 13:14-15 NIV “Now that I, your Lord and Teacher, have washed your feet, you also should wash one another’s feet. I have set you an example that you should do as I have done for you.” Maybe it’s as easy as visiting a local children’s shelter and inviting the little ones to help you with a puzzle, join you in a coloring project or simply participate in story time. 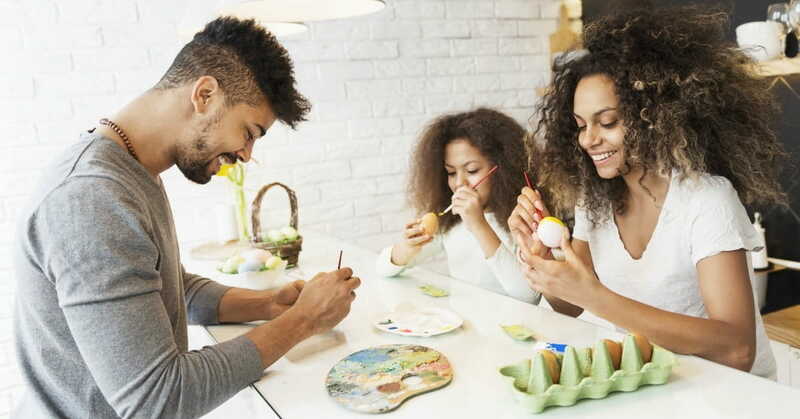 For many of us preparing for Easter means planning family dinners, filling plastic eggs, volunteering for neighborhood egg hunts, and picking out little trinkets for baskets. And while we love planning and participating in these fun-filled traditions, let’s also take the time this year to fully embrace the amazing truths of Jesus’ life, death and resurrection. And let’s guide our families do the same. This way, when we wake up on Easter morning with a renewed sense of God’s amazing, unfailing love for us - we will be fully aware of why.